When both parties involved in the capturing race (semeai) have no eye, the fight is calculated as follows. If there is one or no inside liberty, there is no possibility of seki: one of the groups will die. It is the one with fewer outside liberties. If both groups have an equal number of outside liberties, the one who has sente wins the fight. 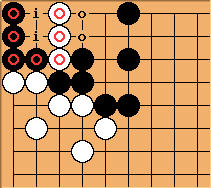 There are 4 outside liberties for White (marked a) and 4 for Black (marked b). There is no inside liberty. The player who has sente kills the other. 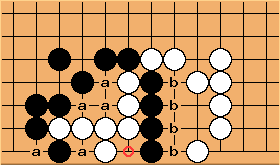 There are 4 outside liberties for White (marked a) and 4 for Black (marked b). The circled point is the only inside liberty. Black goes first to give atari at 7 and capture at 9. Of course, White should realize this and keep 2, 4, 6 and 8 in reserve as ko-threats. 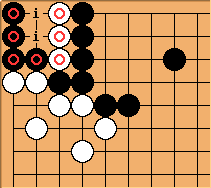 There are 5 outside liberties for White (marked a): the utmost left is an approach move and as such is also counted as a liberty. Still 4 outside liberties for Black (marked b). The circled point is the only inside liberty. So, Black should keep 1 to 9 in reserve as ko-threats. 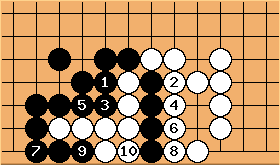 If the numbers are equal, then sente decides whether the defender can make seki or the attacker can kill. If one number is larger, the status is settled as seki or death. The oddity in this formula is that the attacker counts one of the inside liberties for himself. GigaClon I don't quite understand this section could some one post a diagram? tderz: Above formula  can be rewritten as OL1 - OL2 = IL -1. Ok, easier defined: if the difference in outside liberties between the two groups ( Δ = OL1 - OL2) minus the Fighting shared Inside Liberties (FIL, FIL>= 2) is zero, OL1 - OL2 - FIL = 0 then sente decides the outcome. where Δ = F is the critical (unsettled) case where the attacker must move. Which side is the attacker is determined first by comparing eyes: the side with the weaker eye must fill the shared liberties. Any eye beats no eye, all small eyes are the same, big eye beats small eye, and bigger eye beats big eye. If the eyes are the same, the side with more exclusive liberties must attack. Δ = 0 < F = +1, hence White cannot win. Δ < F means that that there are too few liberties (e.g. OLw, OLb) to win the fight! dia. : Δ = 2 ; Δ > F means the attacker (White) has more than enough excess liberties to win the fight. Here Black would waste his sente by adding o, it would not alter the outcome. tderz: Question w.r.t these edit hotspots on the right side of a Senseis page: their position is decided by what? unkx80: Yes, at the start of every section/subsection, marked by lines starting with a "!". See also the pages in the Eyes Collection. inclusive all approach moves, hence not only physical ones.